Cut the calories with these non fried favorite! Use panko crumbs instead of bread crumbs! Still the same crunchy taste just with fewer calories! My secret…mix in Parmesan cheese for cheesy taste! Pair with the spicy ranch dip sauce for a extra kick! 1. Heat oven to 450° F. Toss the bread crumbs with 2 tablespoons of the oil, ½ teaspoon salt, and ¼ teaspoon pepper. Bake on a rimmed baking sheet, tossing once, until golden brown, 3 to 5 minutes. Transfer to a shallow bowl. Place the flour and eggs each in separate shallow bowls. 2. Rub the remaining oil on 2 rimmed baking sheets. Dip the onion rings in the flour and eggs (letting any excess drip off), then coat with the bread crumbs, pressing gently to help them adhere. Bake on the prepared baking sheets, turning once, until tender, 12 to 14 minutes. 3. Whisk together the buttermilk, mayonnaise, chipotles, parsley, and ¼ teaspoon salt in a small bowl. 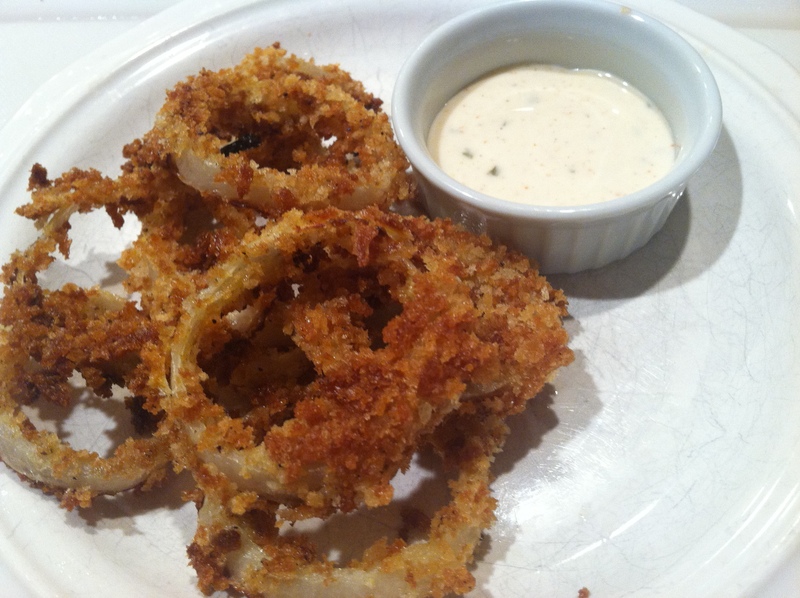 Serve with the onion rings for dipping. Very good idea… I wonder if a simple flour coating would work as nicely? Without the egg it’s harder for the panko to stick- the texture is very different than breadcrumbs it’s very airy so it has a different cooking style! These look delicious! Where did you find this recipe? I’ve been getting into baking things rather than frying and it’s such a great lifestyle change!